The museum workers do not believe that by inviting the perpetrators that they will encourage graffiti artists. Upon noticing graffiti on a fence by the main building, staff at the Pushkin State Museum of Fine Arts posted a message on their Facebook page inviting the vandals to visit artist Lev Bakst’s exhibition for free. 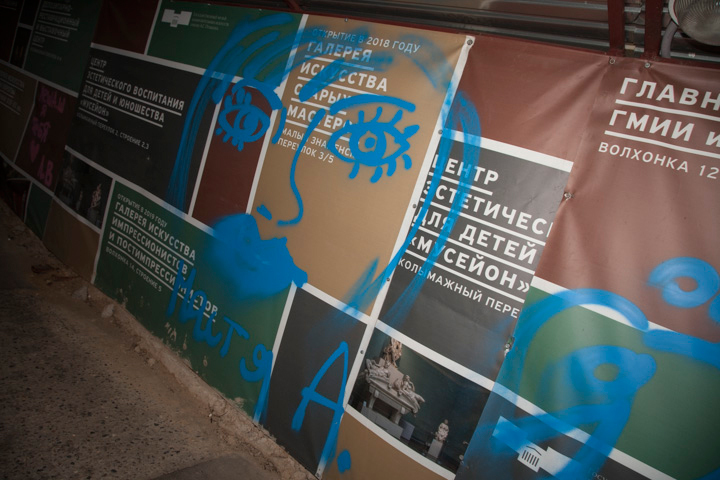 On their way to work one day, employees at the Pushkin State Museum of Fine Arts in Moscow discovered a new “exhibit.” On a fence by the main building they saw graffiti stating: "Everything is in your head, Anastasia. Happy birthday, Nastya. We [heart] you." The suspects signed their names Lyosha, Yura, Lyubava and the birthday celebrant Nastya. Such attention to detail gave the museum a lead in their search for the perpetrators. However, the museum does not to seem to be interested in having them pay for the damage to their property. "We are looking for Nastya, Lyosha, Lyubava and Yura, who graffitied the fence of the main building,” says a statement on the museum's official Facebook page. “As an art museum we cannot ignore this act of self-expression and we therefore invite you guys to visit the Bakst exhibition for free, in order to familiarize yourselves with beauty. Please write us a private message." The accused persons, however, are not hurrying to take advantage of the opportunity, perhaps fearing a trap. "Unfortunately, they are not responding,” said Anna Trapkova, the museum’s deputy director of development. “Maybe they do not follow our social networks." The museum’s staff asserts that the perpetrators will not be punished. "We are always very honest with our [social media] followers, which is why there is no trap here," said Trapkova. The museum has invited the graffiti artists to visit an exhibition of the works of Lev Bakst, the Russian painter and stage decorator who brought exoticism and orientalism to European art in the early 20th century. "We thought that stylistically in a certain way they had been inspired by Bakst,” noted Trapkova. “That is why we would like to invite them to look at real art." "We are just trying to add critical sensibilities to the artists’ own creativity and relationship to urban spaces," said Trapkova.